My father was never what you would call a bass fisherman, but spent most of his time in search of catfish, and his favorite fish, crappie. In fact, the earliest fishing memories I have were spent in the 1950s and 60s with my father crappie fishing from an enclosed, lighted ?crappie house? on Buffalo Lake near out hometown of Lubbock, Texas, or trips we took to Possum Kingdom Lake, an impoundment on the Brazos River in Palo Pinto and Young counties, 75 miles west of Fort Worth, Texas. We not only hooked thousands of fish through the years, it also hooked me on fishing. My dad was smart that way; he knew that introducing a youngster to an active and exciting fish ? crappie ? would open the door for a lasting relationship with the sport. Targeting crappies is an excellent way to introduce younsters to the sport of fish. 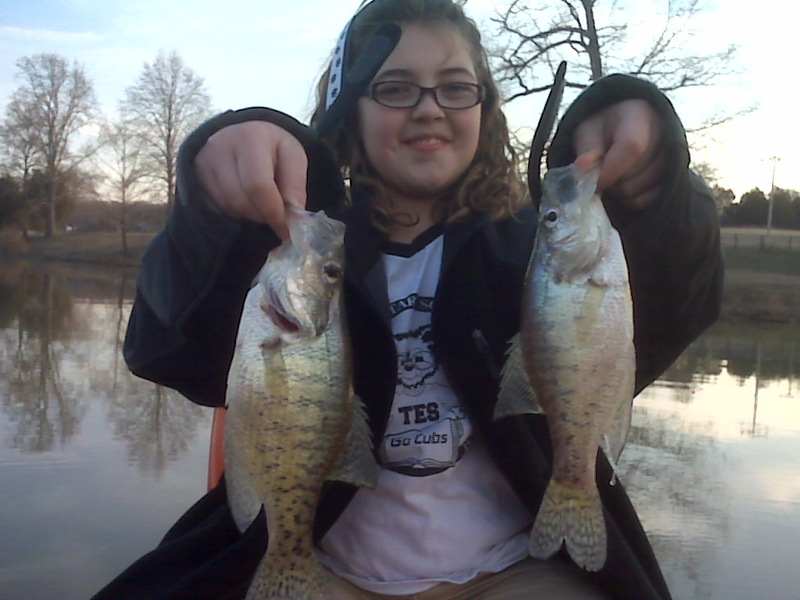 Sydney Starnes of Tompkinsville, KY shows off a couple crappie. Crappies are relatively easy to catch and can be found throughout the country. There are two basic sub-species of crappies: the black crappie and the white crappie. As the names suggest, the black crappie is darker in color than the white, but there are also subtle differences between the two species. As a general rule, black crappies inhabit deeper, clearer bodies of water, while white crappies are more prominent in swallower, stained water. However, very often both species can be found on the same body of water. The web site www.crappie.com distinguishes the black and white crappies by saying, ?The black crappie is usually white or gray with dark gray or black spots covering most of its sides. It has 7-8 dorsal spines on the top of its back. The white crappie tends to be lighter in color and often has distinct vertical bars of gray extending down its sides. It has 5-6 dorsal spines. Both of the sub-species have nearly the same feeding patterns and spawning time.? Both black and white crappies are schooling fish and spend a great deal of their time suspended in open water. The spring spawn is an exception to this rule. Once the water temperature reaches 48-51 degrees, crappies begin to migrate toward shallower water in cuts, coves, or along the shoreline in what is known as the pre-spawn period. Both species will spawn in shallow water when the water temperature reaches between 52-60 degrees. During both the pre-spawn and spawn periods, crappies can readily be found in and around wood cover that is adjacent to good spawning areas. In-Fisherman?s excellent book on crappie, Crappie Wisdom, says, ?Most anglers consider crappies to be cover-oriented fish. That?s actually misleading because both species of crappies spent most of their time suspended in confined open water.? That?s not to say that crappies don?t relate to cover. They do. Spring and fall are both times of the year when wood cover is the first place anglers should go in search of crappies. The Kentucky Department of Fish and Wildlife Resources has aided anglers by preparing good crappie habitat on Barren River Lake by putting out a number of ?crappie hides? in the form of sunken brush piles and stake beds. Barren River Lake crappie anglers can access over 80 of these fish attractors mapped online with GPS locations by going to //fw.ky.gov/app1/WaterBodyDetail.aspx?wid=77 and then clicking on Barren River Lake Fish Attractors in Google maps. 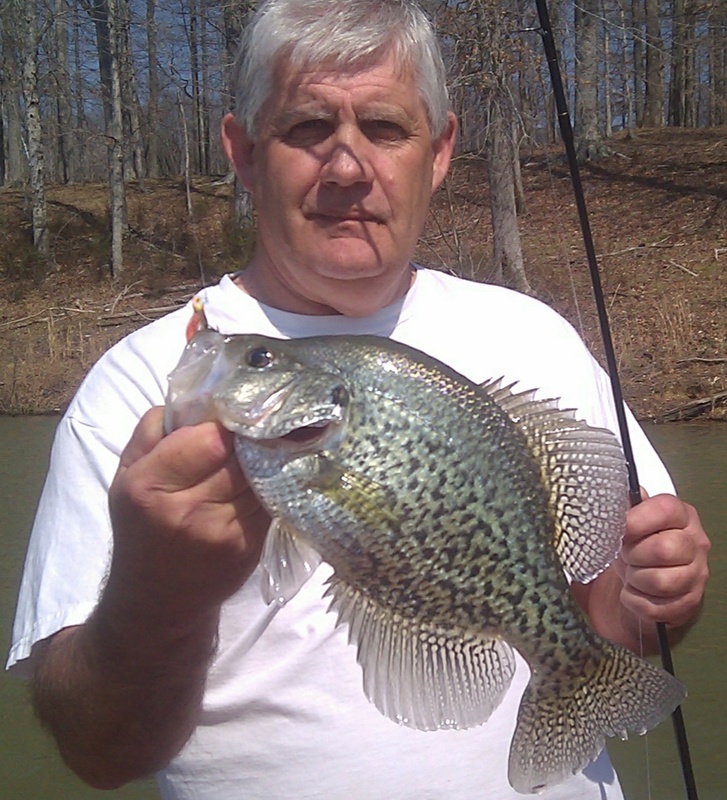 Experienced crappie anglers realize that water temperature is the key to finding crappie. Crappie Fishing USA has an excellent web page that breaks down crappie location and activity according to water temperature. The page also offers tips on what lures and baits will be most productive throughout the year. The page address is //crappief.startlogic.com/id109.html and is highly recommended. Aside from the changes in crappie location prompted by water temperature, crappies by nature are nomads. One tracking study in Tennessee revealed that crappies were recovered as far as 18 miles from the location they were initially tagged. If you find crappies in one location today, there is no guarantee they will be in the same location tomorrow. However, there are some general rules that will help anglers begin their search according to the seasons. Prior to spawning, crappies usually congregate around the entrance to creek arms, and as the water continues to warm, they will move into the back half of coves to spawn on shallow points, shoreline flats, and around wood structure in 3-5 feet of water. Most crappies will move back to the main lake and suspend near deep channels in the summer, but will migrate back to the creek arms in the fall. As the water cools in winter, crappies again migrate back to the main lake to once again suspend near deep channels. Fishing for crappies that are holding to structure is a relatively simple matter; just tie on a minnow or jig and work your bait or lure in and around the cover. Running your bait under a bobber will ensure that it remains at a constant depth and results in fewer hang-ups. Just keep in mind that crappies are more prone to move UP to take bait rather than DOWN. Experiment with different depths to see what produces the best. Targeting suspended crappies will require a little more searching. Using your electronics is a good way to locate suspended crappies. Anglers can also use the ?spider? method to locate fish in open water. This method involves drifting potential locations with a number of rods in the water at different depths; thus your presentations resemble the legs of a spider. If one depth gets more action than others, change all rods to that depth. A longer, light-action rod with spinning reel is the best setup for this technique. Line sizes vary for crappie presentations. One can use heavier line when fishing in treetops because the limbs break up the outline of the line. When fishing in open water for suspended crappies, 4 to 6 pound test is best. Being able to detect the subtle strike of crappies is also important, therefore, high visibility fishing line is recommended. The author with a very nice slab crappie caught on a Float & Fly jig.